When you think Radiohead, you think grooves, right? Okay, I think no one said that, ever. But sure enough, someone has gone and extracted the weirdo time signatures and rhythms from classic Radiohead tunes and made them a downloadable, free pack of grooves for Ableton Live. Now, if at this point you’re saying you’ve never used the groove extraction feature in Ableton Live, this could be a great excuse to learn. for this pack I extracted grooves from every song of every radiohead studio album & consolidated them into a collection of .agr files you can apply to any track in ableton live. to be clear, this pack won’t make you sound like radiohead. it will, however, allow you to humanize, swing, & otherwise alter the timing of your tracks based on the songs of one of the best bands of modern times. what’s more, the various overlapping time signatures of these songs can serve to apply a polyrhythmic feel to your tracks’ rhythms & velocities. if you aren’t using live 9.7.1 or later, these may crash your session. You could use the same feature, by the way, to tap out or play out a groove on an unrelated instrument, then apply it to your synths. 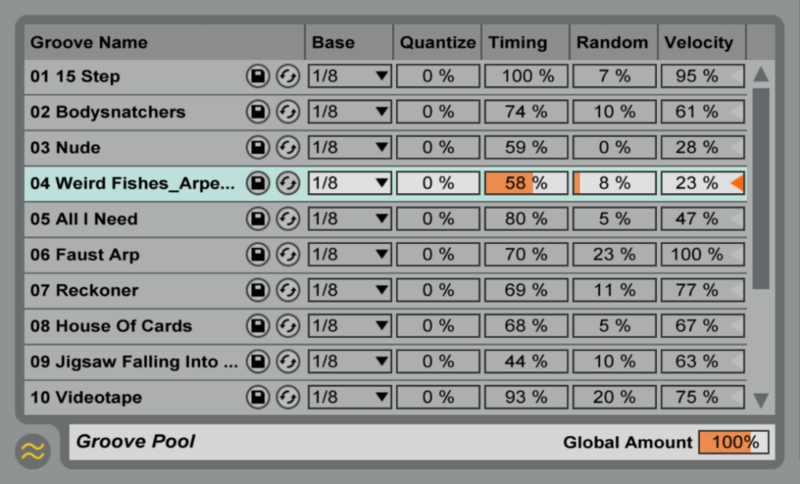 It’s one of the most underused and interesting features of Ableton Live, so I do hope people explore it.